This is a review for Masks. Masks is 335 pages. It is available as a pdf, a softcover, and was available as a hardcover. In the introduction it suggests this a book you will want to have on hand for every session. I have the softcover book, and I will say that I do not think the binding is up to this, and with me using my tablet more and more at the table I am considering switching to electronic format to preserve my binding. Masks is black and white throughout. It is divided into 3 major sections, Fantasy NPCs, SCI-FI NPCs, and Modern NPCs. Each section has three subsections, villians, neutrals, and allies. All sections are equal length (one is 1 NPC longer) with 111 NPCs. The book is well laid out and edited. There are usually 4 NPCs per page, and there is no overrun between pages. There are occasional pieces of black and white artwork of NPCs, these are often 1/4 or 1/2 page pieces. This is a system agnostic book. There are no stats you can plug into an RPG game to give the NPC's health, weapons skill, etc. I think this is a good thing. Too often NPC's are controlled too much by their stats, but they are an environment to interact with, and this interaction is what makes NPCs memorable and useful to everyone at the table. Each NPC has a name, a two word description such as "Possessed Cleric, Sadistic Planner, etc) a short description, some roleplaying advice, a brief personality and motivation, and a slightly longer background, and two traits. Also included is also a direct quote that you can use when DMing the NPC. These quotes are a really good idea and well thought out, the quotes link in with the character's background, and roleplaying suggestions. For example "Yes, I married him for the money. Quit acting so shocked. He knew what he wanted and so did I. He died, I'm rich and there was no foul play. Now go think your small-minded thoughts elsewhere" You already know a lot about the character. It also helps that the quotes work when directed to PC's or merely overheard by them. The appearance, roleplaying advice and personality is okay and what you expect. The good is that the sentences are short, direct, and different for each NPC. (Nothing worse than having 900 identical NPCs). My real complaint is more of a style issue here. I find NPCs work best if you assume the players will see them through a dark glass, so you need to pick a vibrant color or trait and mention it over and over and over again. Not all of these PCs give an immediate hook that you can do this with. However I am aware I have a particular style with NPCs and this may not be your style. The backgrounds are usually well done, some of it can immediately be revealed to players, but there are often sections that can be kept secret to come out later. This means that your NPCs immediately have the possibility for more depth. Each NPC has a collection of traits. Traits are 47 distinct things in this book such as aggressive, famous, child, hideous, warrior, etc. These help in selecting classes, and are of course useful for indexing. This book has attempted to be as balanced as possible. There are 500 male NPCs, and 500 female. The use of traits is balanced across the NPCs. As is the number of heroes and villains. This means that there really is a wide range of NPCs here. One thing that I found particularly good about this book is that it is designed for DMs and is useful for DMs. For example one of the few things that is not balanced in this book is the characters are predominantly human. The introduction mentions this but says the NPCs are designed to be easy to reskin. In fact they illustrate some of the human NPCs as non humans. Very very little of the NPCs backgrounds/creation is dependent on race. They could just as easily be elfs, dwarfs, or halflings. This is shown in other things, such as an appendix that has precreated groups of characters in it, for a ready to use city watch unit or academic organisation. Unfortunately my biggest issue with using it as a reference book at the table is it is missing what I would consider to be the most useful piece on information "An index as to where you would find these people." As DM's we've all been there. Its the "we are in a church, I'm going to find a bystander to ask him about things" or "as we're at court I'll try to talk to a countess. : To me the time I most often have to make NPCs up on the spot is location specific. This book fails in this area, as its hard to locate that appropriate NPC that is in the mines right now. This is a very useful book. It is particularly useful in session prep. I will use it to have some NPCs on hand who could be 'semi key'. Which means they are engaging enough the party may want to revisit them, but if they aren't interesting won't push the story forward. The premade parties are particularly useful if the party is going away from my planned script (i.e always). However for the ability to rustle up a NPC on the spot, I still use some random tables I make at the beginning of each adventure. I think this is worth buying, and I would recommend the pdf version or hardcover if you can find it, as I'm not overly happy with the softcover binding. 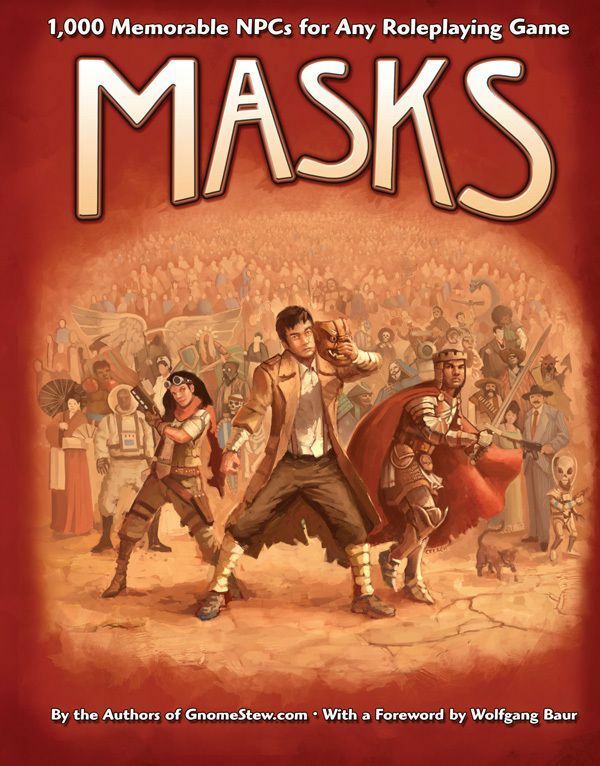 Thanks for reviewing Masks, John! You're more than welcome Martin. I will have to say if it weren't for my memory for design, and your logo part as your over badge I wouldn't have known who you were.